A Buffalo Center nursing home is being fined more than $77,000s in part over the treatment of an 87-year-old woman who officials say was in pain and may not have had water several days before her death. The Iowa Department of Inspections and Appeals had previously proposed fines against the Timely Mission Nursing Home relating to the February 27th death of Virginia Olthoff, the treatment of another patient who died the same day and the assessment of a woman diagnosed with a colon inflammation. The state did not impose a proposed $29,250 fine so the federal Centers for Medicare and Medicaid Services could take over the case. CMS on Friday notified the nursing home of the $77,462 federal fine for what they termed as deficiencies in pain management and quality of care. Timely Mission officials have 60 days to appeal the CMS decision, but if they waive their right to an appeal hearing, the fine would be reduced by 35 percent. 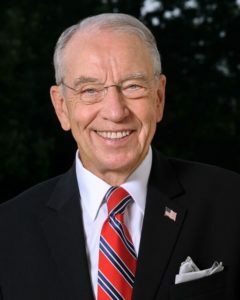 Iowa Senator Chuck Grassley demanded more information about the case last week calling it “heartbreaking” after no action had been taken since the woman’s death in February. In a conference call with reporters this (Tuesday) morning, Grassley was asked if the fine is sufficient.